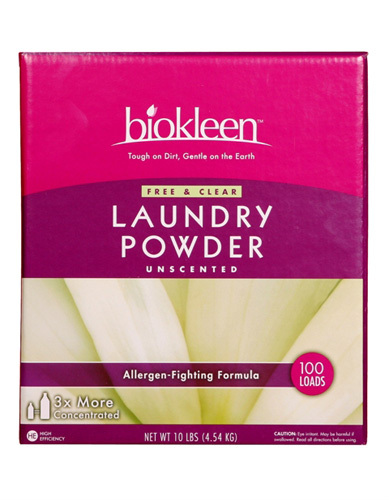 Our Free & Clear Laundry Powder is fragrance free, and like all biokleen products is clear of dyes and brightners. Removes the toughest dirt, grease, stains and odors, yet is gentle enough for cloth diapers, delicate fabrics and hand washables. Rinses clean leaving no residues on clothes that can irritate skin or ruin fabrics. • Safe for high-efficiency washers. Biokleen products have always been free of synthetic fragrances and clear of dyes or brighteners, making our products a safe and effective choice for those with chemical sensitivities and allergies. There are some people who cannot tolerate any fragrance, natural or not, making our Free & Clear Laundry Powder a perfect alternative. You get the same cleaning power as our original Laundry Powder, and like all of our products, is super concentrated. - Enviromentaly Friendly with no negative effects on rivers, stream, plants or wildlife. INGREDIENTS: Soda Ash, Zeolites, Sodium Citrate, Vegetable FIber Chelators, Sodiom Percarbonate, Grapefruit Seed and Pulp Extracts, Orange Peel Extracts, Natural Corrosion Inhibitors, Surfactants-degreases and Conditioners form Coconut and/or Corn, Low pH Silicates, Sodium Sulfate.